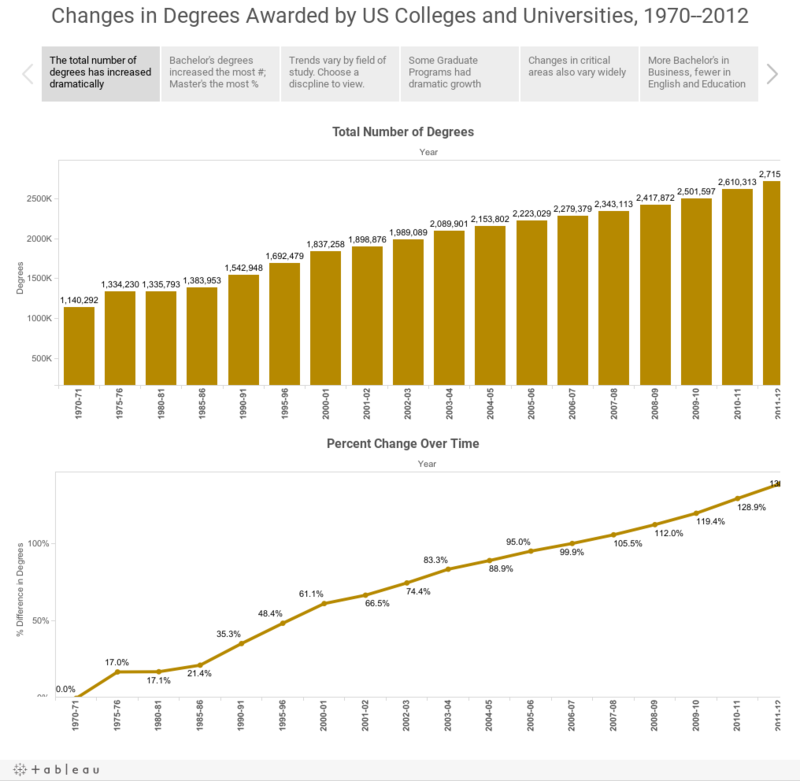 As we continue the push to enroll and graduate more students from colleges, it's interesting to look back at trends in degrees awarded, at the Bachelor's, Master's, and Doctoral levels over time. So, I downloaded data from the Digest of Education Statistics and came up with this. At the very top level, we see that the number of degrees awarded has increased dramatically since 1970, although of course so has the population: It's up about 51% since 1970, while degrees awarded increased 138%, while bachelor's degrees increased just 113%. You can't say after looking at those statistics, however, whether we've been successful or not; along with the increase in population comes shifts in age distributions, as well as ethnicity and wealth, all of which affect the likelihood of going to college. Still, the interesting stuff comes as you scroll across the gray boxes on the top, and drill down by academic discipline: Decreases in English and Education, and increases in business and health professions at the undergraduate level; increases in some narrowly focused programs at the graduate level. Play around. Filter and click. What do you find interesting?